This is an INTRODUCTORY class for people wanting to start learning how to program computers. It is intended for people who have never programmed anything before; we can’t cram an entire college-level programming class into one evening, but this class should leave you in a good place to keep learning on your own or attend one of our classes on more advanced topics. The class is taught in Python, an easy to learn but very powerful programming language, widely used in fields as diverse as scientific programming, web development, scripting, and video games. There will be follow-on classes dealing with more advanced programming, and on interfacing with the Raspberry Pi computer to control electronics systems such as robots. • A laptop! Or some other computer. Windows or Mac or Linux, anything will work. 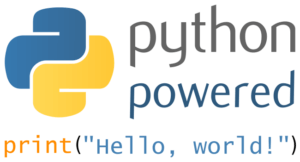 • Python! Download it from https://www.python.org/downloads/and install it on your laptop ahead of time. • A text editor! I recommend Sublime Text (http://www.sublimetext.com/2) or Notepad++ (http://notepad-plus-plus.org/), both of which have functional free versions. This is an opportunity to learn a new skill, build something, and taste some brews from local Pittsburgh craft breweries. 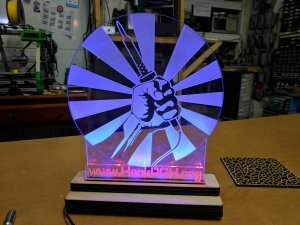 We will go through the process of converting a graphic file into an etched acrylic plaque, and then through the process of building a base with LEDs to light it up. The photo above shows an example. Just imagine that the Soldering Iron logo is your custom logo or image, and the text is your custom text. This is a basic workshop and will cover modifying graphic files using InkScape, using the laser cutter to cut and engrave, and basic LED wiring. Bring a graphic file to be etched, laptop not required. NOTE: Students will need to bring/have web access to the graphic to be etched on the light.